Riding through the streets of downtown Calgary, a police officer sets the pace for the annual Calgary Stampede Parade. Along with police officers you will find hundreds of entrants that take part in the Calgary Stampede Parade which includes hundreds of horses, floats, clowns and music. 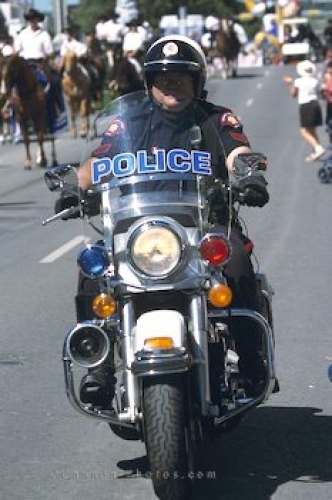 Picture of a police officer leading the Calgary Stampede Parade in Alberta, Canada.